We spent most of Sunday in the resort itself. After a sumptuous breakfast, when we brought Zara to the beach, we saw horses available for hire. Zara was very interested, and said, “Want to sit horsey!” When I asked if she was going to ride on her own, she said, “Mummy sit with you (me).” So I went with Zara. It was just a stroll on the beach, with the horse handler guiding the horse on the leash. She really enjoyed herself, patting the horse on and off, and kept saying, “Zara so happy.” When we got back, she thanked the horse and patted it. The horse handler mentioned she’s very brave because most young kids would have been quite fearful of the height while being on the horse, and the size of the horse. 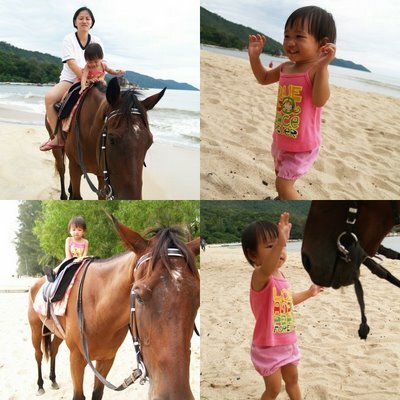 Zara and mummy on the horse; Zara patting the horse to thank it; Zara running about and playing in the resort compound. For late lunch, headed to town for Sisters’ char kuey teow in Macalister Road. Zara was tired and dopey, and only had some prawn fritters from the lobak stall. Then it was a wasted trip to Komtar. Our intention was to get more DVDs (as we got some really good quality foreign film there on our last trip), but because of the raid, the shops were closed, so we left empty handed. For dinner, it was again to Nonya Breeze. 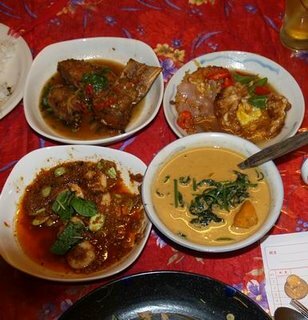 This time, it was 4 dishes (fish, prawns, vege, egg), 1 duck soup, 1 nasi kerabu, 3 drinks, and the bill was less than RM50. On Monday morning, Zara wanted horsey ride again. This time, the handler told us he would bring us further, but when we were heading back, Zara asked to get down, she was complaining, “Bum bum pain pain.” from the long ride. Zara patting the horse while on it; Happy to be on the ground again because her bum was hurting; Back up the horse alone for a photo shoot; Thanking the horse and saying good bye. We then had to check out and move to Equatorial Hotel (as it was nearer for Daddy to get to Prai for work). Daddy headed off to work after dropping us off. Zara and I had a slow leisurely buffet lunch, all she had was some almond flakes and a scoop of ice cream when mummy pigged out. Back in the room, I had the TV on for her (Tom & Jerry was on) while I washed her bottle in the toilet. 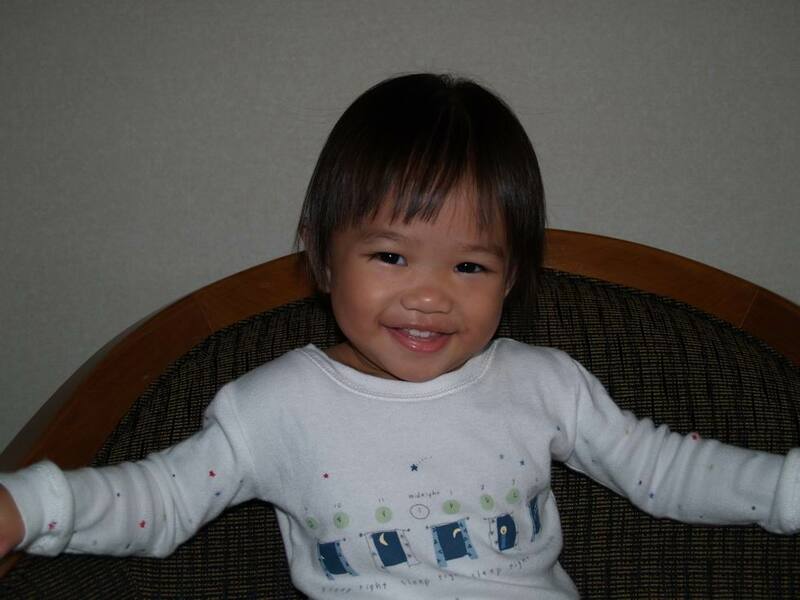 Suddenly, I heard her crying outside, I rushed out to check on her, “what happened?”. She just pointed to the TV and said, “Cat cat so naughty. Make puppy cry!” And tears started pouring down again. My gosh, she was crying over the scene where Tom woke up a puppy from its sleep (and it started yelping) while chasing after Jerry. No more Tom & Jerry, since it got her so emotional. Evening was swimming again, and this time, another achievement from her, she could actually let go off my hand, and paddle on her own (with arm floats of course) for a few seconds. That night, we just had dinner in the hotel as we were too lazy to go out (and don’t know where to go). Tuesday, Daddy left early in the morning. I brought Zara for breakfast, then a swim, and then we had to check out (bloody hotel wouldn’t let us have late check out!). Spent the next few hours loitering in the hotel, and also in Bukit Jambul mall while we waited for Daddy to pick us up after work. To get to Bukit Jambul mall, we had to take a cab there, and Zara refused to get on the cab. She actually pushed the door shut while I tried to get her in, she said, “Want to sit only mummy’s car. Don’t want this car.” Such a fussy girl. Even though it’s a bit tiring for me to handle her alone (esp lugging the bag containing her water, biscuit, Mr Blue, and our gigantic camera etc; and sometimes having to carry her to walk up and down stairs, with the stroller strapped around my shoulder), Zara was a good girl, and it was very easy to take care of her. Most of the time, she just let me push her about in the stroller, and she kept occupied by singing and reciting nursery rhymes to herself. Daddy came to pick us up from the mall at about 5pm (since no cab wanted to take us back to the hotel or asked for exorbitant price. I heard cabbies were on strike that day because they were supposed to start to run on meter that week), and we headed back to KL. Geng! Still can riding horse now! Wow,Zara so brave to have a horse rode. I let Jo tried before but he wasn’t as brave as Zara. Anyway, you’re the bravest. Please don’t do this again as you really shocked me. The horse was just walking.. not galloping ler. I’m aware of my situation but she wouldn’t let Daddy sit with her. So I have to go loh. Hubby was worried in the beginning, but we told the horse handler I’m pregnant, and he assured me it was ok since the horse will be walking and not galloping. Eating out in Penang can be cheap if you know where to go. I’m very careful one, don’t worry. Yeah.. hint to your hubby.. but like I mentioned in the earlier comment hor, depending on where your husband is, if he’s working in the Penisular, then it’s really boring one ler there. I sked sked, but Zara needed me, so I just be a bit careful loh. Haha.. she missed home though. When she gets bored, she’ll say, “Go home”. She missed her TV the most. That was her morning shot, just woke up.. And that’s what greet me any morning.. aaaaaaaa.. The horse was going really slow la.. so it wasn’t that bad for me. But I was a bit afraid of the height.. although Zara wasn’t. And you are so brave leh…riding horse somemore! Salute you! You’re very gungho to ride the horse at your stage! Zara even more so! That girl has a very spunky attitude for her age! And she’s looking quite tanned. Did you apply sunblock for her? Children do get emotional easily. My boy used to cry when he saw scenes of children playing with dogs, or mummies making babies sleep. such brave girl to be sitting on the horse by herself. it’s great that she is able to communicate with you all more now huh? like mother like daughter hor, so brave! Joelle haven’t seen horse before lei. Zara is a lucky girl so little can experient so many thing…. aiyo..with ur big tummy still going around with so many things!!! 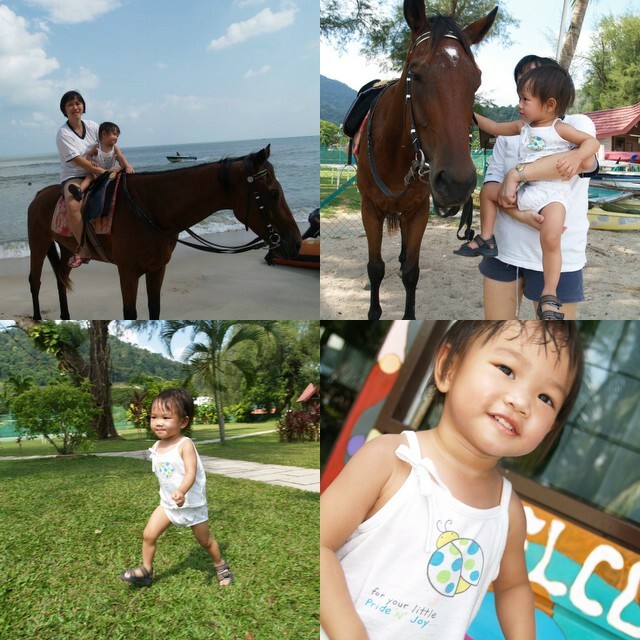 beside marine biologist, zara can be jockey. so young got style alridi!! I always eat at this coffee shop called Bee Hooi at Pulau Tikus, the best asam laksa, popiah,”orr chien” and char kuey teow oso not bad! Yum..Check it out next time! i can’t believe those cabbie drivers would want more money despite your condition (preggie & w/ a toddler). What blood suckers! I heard after you sat on the horse, they had to put it to sleep liao. The back broken liao. Hahahahahaha!!!! so nice to see Zara’s speech is pretty advanced. My boy is almost 3 yrs old and have only started saying some words few months back. We are waiting for the day that he can speak like zara. The horse was going really slow, so nothing to worry right? Hmm.. I must be very ignorant to think that riding a horse is no problem especially since it’s just trotting, and not galloping. Next time I won’t attempt again. Actually Zara is born tanned, still I did apply sun block on her. Huh? How come those scene can stir up such emotions in Gavin? Yes, it makes it easier since she can tell you what she wants, and what she doesn’t and why. Wah.. Aunty YL bravo Zara also. Zara sure very happy. I think if the horse is galloping then it’s not good, but it was just walking. So I thought there isn’t anything to worry about (or so I guess). Tummy not that big yet, but not strong like last time only. Wah.. should have asked for recommendations before we went to Penang. That way, we’ll know what to eat. Next time.. I’ll try your recommendation. No la. The horse was in tip top condition after I rode on it. Psst, Cocka always like that one. He always mistook me for his wife’s size. I think most boys’ speech development is slower than girls. So don’t worry.. soon he’ll also be a chatter box. Guess everyone has said abt the horse riding. Glad you’re having a ‘swell’ time with family. I’m sure Zara treasures all these fun times before baby comes along. Will be praying for you on Monday. Zara is indeed brave with horse for her age..
Truely ur morning sunshine indeed! Thanks for the prayer. Needed it. It’s also for me, I would like to have fun fun fun before the 2nd baby comes along, and it would mean we’ll be home bound for 1yr before we could take holidays together. Thanks, the thing is we’d never developed any photos with Zara in it. A shame huh?